Our ONE COAT water seal stops penetrating damp using the latest fluorocarbon technology to create simply the best performing (100% breathable) brick and stone sealer available today. With a lifespan of up to 10 years and no surface darkening, this formula halts rainwater absorption offering truly exceptional hydrophobic or bead up water repellency. Kingfisher Approved contractors can offer a 10 year re-pointing guarantee, incorporating Kingfisher pointing mortar and pointing solution. We contacted GMT Pointing because of condensation and damp problems we were having on our Victorian Vicarage. We had quotes for repointing, as this had been done in Sand and Cement and should have been Lime. We had 2 quotes and we were quoted in the region of £7000. This was out of our budget so GMT Pointing offered to Water Seal instead of repointing as the pointing was sound but was just the wrong material and was not allowing the building to breathe. GMT Pointing installed their water sealing system as the building was holding moisture this prevents the penetrating rain from soaking into the wall. This was a quarter of the price of repointing. I would highly recommend GMT Pointing as he seemed very honest and very reliable". Our water seal prevents damaging moisture ingress which causes masonry to spall in the freeze / thaw cycle and inhibits moss growth by robbing it of water and nutrients drawn from damp mortar. Using Our Water Seal to dry out a damp wall can also reduce thermal loss by up to 30% because a wet wall is a cold wall and "bleeds" heat to the atmosphere at an accelerated rate. Drying out with Our Water Seal also reduces the problem of condensation and black mould, which develop on the indoor side of exterior walls when rain saturation cools the wall temperature such that warm moist indoor air condenses on the cold surface. On a related issue, if you have problems with efflorescence or salting which is the unsightly, white staining we see on so many new build walls then Our water seal can help by limiting the moisture absorption / evaporation cycle which leaves mineral salts deposited on the surface. Please call us for detailed advice on treating efflorescence. Our water seal also helps to keep buildings clean by forming an effective barrier against airborne dirt and other contaminants, which would otherwise be dissolved by rainwater and leech into the substrate where they inevitably stain the surface. Finally, if you have previously applied cheaper alternatives which may have worked for a year or less (or not at all!) then this product is for you. Save hundreds or even thousands of pounds on remedial re-pointing, re-plastering and re-decoration by treating your external walls, facades and gables with Our Water Seal, the ultimate in water seal for your masonry in extreme weather. Most common building materials (brick/ stone/ mortar / block) are mineral based and are therefore ultimately prone to moisture absorption, especially when exposed to the elements for long periods of time. Water is a persistent invader and it will find tiny fissures in masonry and gradually work its way deeper and deeper into the fabric of the building. This moisture ingress is exacerbated by the freeze / thaw cycle which spalls masonry and further expands the tiny cracks and fissures in a continuous cycle of decay. Our Water Repellent creates an invisible hydrophobic barrier which repels rain water and prevents the moisture from absorbing in the first place. As weathering increases the porosity of masonry, moss and green mould can begin to take hold. Our Water Repellent inhibits moss and other organic growth by robbing it of water and nutrients drawn from damp masonry. This is an important factor because moss in particular exacerbates water absorption by retaining moisture and sending damaging roots into the substrate. The factors described above can ultimately lead to penetrating dampness. Penetrating dampness occurs when moisture migrates all the way through the wall to the interior of the building - often during periods of prolonged heavy rain when the walls are continuously absorbing water. This "mass water" absorption combined with capillary action shows up on internal decorative finishes as damp patches on plaster, peeling wall paper, salt damage, black mould etc. It is often accompanied by an unpleasant musty odour. Our Water Repellent stops penetrating damp by eliminating "mass water" penetration. Even if a wall is not actually leeching moisture all the way through to the internal plaster (penetrating damp), partial saturation can still cause “cold bridging” whereby exterior cold is transmitted through the wall to the interior causing a “cold spot”. Drying out with Our Water Repellent reduces the problem of warm moist indoor air condensing on the “cold spot” surface and breeding black mould growth. 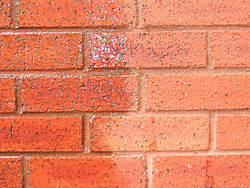 Damp porous surfaces tend to readily absorb airborne dirt, carbon and other pollutants which are then dissolved in rainwater and carried into the top 2 to 3 mm of the masonry. This dirt builds up over time and can lead to unattractive dark stains. Our Water Repellent’s molecular structure prevents the moisture absorption thus breaking the cycle and does not change the colour of the material to which it is applied. Using Our Water Repellent to dry out a damp wall can also reduce evaporative thermal loss because a wet wall is a cold wall and "bleeds" heat to atmosphere faster than a dry wall. A common problem which blights the aesthetic appeal of many properties is “efflorescence" or "salting" which is the unsightly, white staining we see on so many “new build” walls. This occurs because walls are built of mineral based products including clay, sand and cement, all of which come from the ground, which in turn is naturally full of chlorides (salts). These salts only come out of the masonry “in solution” i.e. when the surface gets wet from rainfall etc. 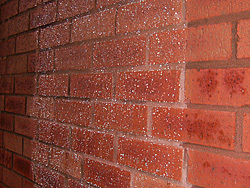 As the wall dries out after rain, the water evaporates leaving the white salt crystals. Our Water Repellent can help by limiting the moisture absorption / evaporation cycle which leaves mineral salts deposited on the surface. Please call us for detailed advice on treating efflorescence. Do you suffer from condensation, damp problems, rising damp, penetrating damp, black mould? Then contact us today to find out how our ONE COAT water seal can solve your issues!